The Netgear RangeMax WNDR3700 is a low-profile compact box that is finished in a high-gloss black and comes with the antennae built into the device. It ships with a stand, so you can lay it flat or stand it vertically for slightly better reception. You'll find the usual row of LED activity lights as well as WPS and Push 'n' Connect buttons on the front, along with four LAN and a WAN port on the rear, along with a USB connection. Like the D-Link, you'll find 'Green Technology' is built in, so if you're not using any of the LAN ports they will automatically switch off and the corresponding LED light will dim. If you're looking to use this router with Windows 7, you'll need to check out the Netgear website where a download is available. Our review unit didn't come with installation software in the box, though we've been assured this is the case, so we used this latest download and found that it installed quickly. The interface is a little cluttered, but quite intuitive. You'll find some useful features with this router, such as remote management, so you can access the network when you're travelling and video mode that allows you to define bandwidth in the 5GHz spectrum for streaming video. Where the WNDR3700 fell down was in terms of speed, being one of the slowest routers we have tested recently. We found that while the 5GHz frequency traffic ran well, everyday throughput on the 2.4GHz channel fluctuated widely. 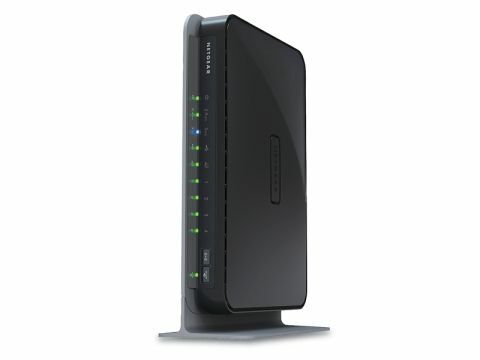 The Netgear RangeMax WNDR3700 offers a wide range of features that experienced users will find appealing. However, we found data speeds to be the slowest of the three units on test, making it less than ideal for use with busy households looking to share a connection.